Keep it Shut, by Karen Ehman probably played a large role in my taking a few months off from blogging. Not only were we at the end stages and culmination of an adoption but there was just a lot going on in life at the time and the need to keep one's mouth shut was - is - pivotal. It was a good time in life to brush up on the type of speech (or silence!) that the Bible required of me. Now, I'm a pretty private person by nature. By that I mean, I have to really know and trust a person very. well. before I'll start sharing about certain aspects of my life. I also am an extremely loyal person and prize loyalty in others. When I trust someone with my family, I very well expect them to protect me and mine and, likewise, I'll do my utmost to protect them as well. This doesn't mean that it's always easy to keep a secret. Sometimes its very much not, but it's something that I care very much about trying to do. Now, I'm also a very "blunt" and "forthright" person by nature. These are some words which other people have used to describe me: intense, forthright, straight forward, opinionated, etc., etc. (I trust you've got the picture!) I've heard some of these things enough times to know that I still have work to do when it comes to the subtitle of this book which is, "What to Say, How to Say It, and When To Say Nothing at All." Aha. Now we're talkin'! (Or aren't we?) Let me be dead straight with you and say that I'm not here to write a post telling you about all of the words that I've strung together incorrectly in my past. While I certainly do have experience in communicating poorly with others, I also have a blessed list of times and experience where the right words were used at the right time. I'm not here to debate how any particular person feels about me or even how I feel about myself. I'm just laying out the facts about my personality which are known and acknowledging that I understand that I have more things to learn. I expect that I'll go on learning them my whole life, Lord willing (and it would appear that He is). I can very well acknowledge mistakes but I also feel very secure in the knowledge that God gave me the personality that He did for a right good reason and I cannot apologize for that anymore than I'd ask another person to apologize for their personality. We each of us have strengths and weaknesses. If I were to venture a guess, we each have strengths and weaknesses when it comes to our tongues, both when and how we use them (and if our brain is connected to the process when we do!). Because I understand there is always room to mature and grow in the area of right speech and Christianity, I'm always on the lookout for titles which address the subject. 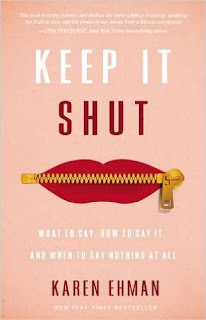 Keep it Shut is not just a good read for that friend or relative you know that you wish had better communication skills. (They probably think that you need some help in this department as well. And let's be honest - you do. I do too.) This is a good book for all women to read. Why? Because we're alive. Because we speak out loud on a daily basis and with great regularity. Because we type e-mails and answer phone calls, raise children, and make eye contact with the checker at the supermarket. Unless you exist in some sort of abnormal solitary confinement then you probably have need of this book. This is my first foray into the world of Karen Ehman and I really had no idea what to expect. I quickly discovered that she's a very chatty writer. She opens by describing herself, much like I did above. In fact, we are pretty similar in personality (I think). She introduced herself and then "talked" at me in a way that suggested to me that she is very comfortable conversing with others. She enjoys a laugh and loves to tell stories (which is great because I love stories) which all work to keep this book friendly in nature. It is chalk full of scripture which she provides alongside practical application in an easy-to-swallow manner. Chiefly, she offers scripture and advice for how the reader can learn to be more Christ like in their communications with others. There is really nothing to complain about with this title, so long as you like her writing voice. I didn't mind it and so I enjoyed the read in so much as it was an encouragement and reminder to order my speech aright. Life is a sensitive business at times and we do not really live in a society that values privacy and/or respect of others. Giving someone the gift of safety in your speech is a huge, huge thing not to be discounted or dismissed. Speaking truth in love is becoming a lost art it seems, but being a person who wants to do that well is a sign of both salvation and grace. I don't know where you are in life right now but so long as you are alive and talking I think Keep it Shut is a title worth considering. Ehman knows the struggle of the wild tongue and is actively seeking to control hers for the glory of God. That's all that I could ask from anyone. I appreciated her encouragement, advice and admonition, as this is a subject that I seem to be focused on with great regularity. I don't really have any highlights from the book to offer, in part because of Ehman's chatty nature. There weren't any stand out passages, just general encouragement to stay the course and submit your speech to God. This is a message that I think we would do well to take heed of and give some thoughtful consideration. Note: This book was not received for review from the publisher. I invested my own money into this read because, as mentioned above, I'm always looking for titles on this subject which do their best to instruct women in the beauty of Biblical speech. Another title I really loved was A Way With Words, by Christin Ditchfield. That title is linked to my 2010 review if you'd like an overview. This sounds very good. I think our culture in general could stand to learn a little decorum in our speech nowadays but I know personally I could very well use some focus in this area. Would this lend well to a group study? @Susanne - Yes! It would work wonderfully well for a group study. It's one of those odd books you don't *really* want to recommend for a group study because people will automatically take offense by the suggestion. ;) At the same time, it's one of those books that you really want to recommend for a group study! Ha! Actually, Ehman has produced a video series for just such a purpose and there's a separate study guide available.